Sulfur deficiency is easy to spot and can be simple to manage. Characterized by yellowing leaves or telltale yellow streaks and spots on fading green plants, sulfur deficiency is becoming a growing problem in many crop production areas. Alfalfa is an especially heavy user of sulfur. A recent Minnesota Crop News blog explains that while a plant’s main supply of sulfur is stored in the soil’s organic matter, plants may require an added application to sustain high yields. 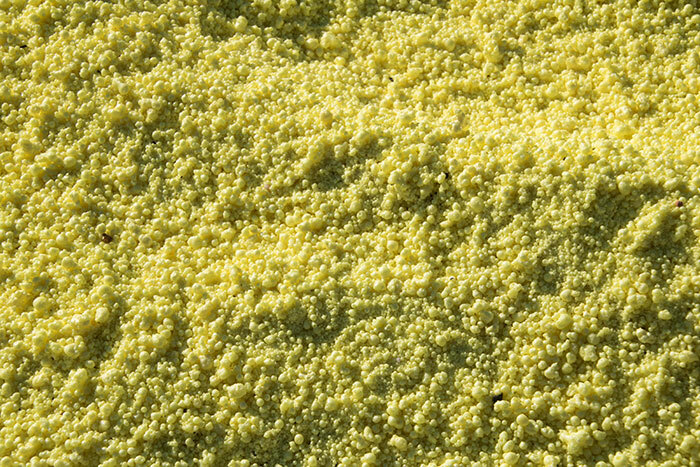 Daniel Kaiser, soil fertility specialist with the University of Minnesota, shares five tips for profitably managing sulfur to get the most out of both fields and applied sulfur. Kaiser begins by urging producers to first determine the crop’s need for sulfur and how responsive it would be to added applications. Annual applications are needed for crops with high sulfur demands such as alfalfa and canola. Corn is also a widely grown crop that has had success with sulfur applications, Kaiser adds. Although helpful, soil tests for sulfur cannot indicate where exactly a deficiency will occur. Kaiser recommends looking at the top 6 inches of soil organic matter to determine where concentration is lacking and deficiency may occur. “Deficiencies are most common when soil organic matter concentration is below 2 percent but can occur even up to 4 percent organic matter concentration,” Kaiser says. In order to be utilized by a plant, sulfur must first mineralize into sulfate. This is contingent on microbial breakdown of organic matter, explains Kaiser. Mineralization is hindered by cool and wet soil, causing sensitive crops to require added sulfur regardless of soil organic matter. As a result, poorly drained soils can often appear deficient early in the growing season. Kaiser acknowledges that applying just 10 pounds of sulfur per acre can do a lot for fighting early signs of deficiency. “Recent research shows that the corn plant takes up roughly 10 percent of sulfur by the V6 growth stage, 50 percent between V6 and silking, and 40 percent from silking until crop maturity,” Kaiser says. Although a plant doesn’t need much sulfur early on, this first stage of growth is crucial. Kaiser notes that this is when sulfur availability is at its lowest and the soil must be maintained. If corn appears to be lacking, producers can even apply sulfur through V5 to V6 without seeing a reduction in yield. However, Kaiser recommends earlier application so that the growing plants have plenty of sulfate sulfur during their V6 stage peak. Sulfate formulations are the most common fertilizer sources of sulfur. These include ammonium, potassium, or calcium sulfate. On the other hand, elemental sulfur cannot be used by the plant until it is oxidized by soil microbes, Kaiser says, warning that this may be delayed by cooler weather and the size of sulfur particle applied. In order to provide adequate sulfur at all times, Kaiser advises applying sulfate sulfur with elemental sulfur. “Targeting the right product depends on many factors but can go a long way to ensure you are getting the most out of your investment in sulfur fertilizer,” Kaiser says.